Chris Jones is arguably the most decorated footballer in the history of Tasmanian regional football. After debuting for North Launceston in 1997 he retained his position as a speedy midfielder throughout the Bombers’ unprecedented, undefeated run under Mathew Armstrong in the 1998 TFL season. Following a stint with the Tasmanian Devils in 2001 Jones returned to his original club, George Town, and helped create an Australian record for senior football that will be very difficult to better. The Saints won eight consecutive senior titles in the NTFA with Chris Jones as their most distinguished player, securing no less than nine association and club best and fairest awards during this platinum reign over the competition. From 1998 to 2009 Jones competed in 12 consecutive grand finals: four for North Launceston and then a further eight for George Town. This humble centre field specialist played no small part in his clubs’ success thanks to his team play, hard work and genuine pace which allowed him to easily get around his opponents and carry the ball towards goal for his team mates. 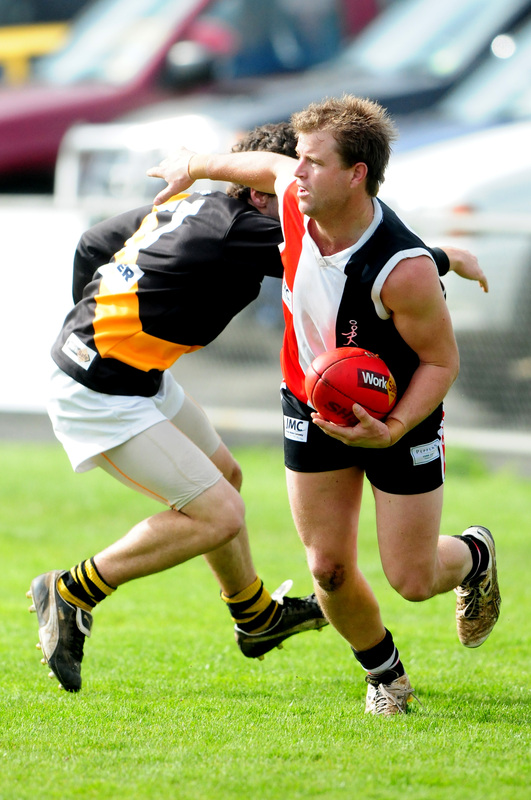 Chris Jones was the ultimate midfield offensive weapon in Northern Tasmanian football throughout much of the 2000s.